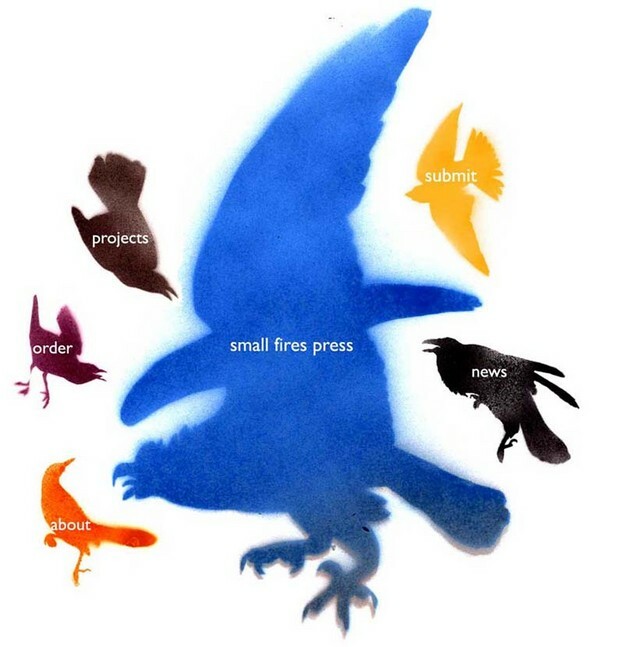 Friedrich Kerksieck established Small Fires Press after meeting Walter Hamady in 2004. With a handful of titles to his credit, he enrolled in the esteemed MFA in Book Arts Program at the University of Alabama, where he studied with Steve Miller. Being an entirely self-taught printer, I’ve always been a little bit jealous of those who have had the opportunity to learn the finer points of typography and printing from Miller, who in turn, learned from Hamady when he was a student in Wisconsin in the 1970s. Hamady, in turn, was inspired by (but never formally studied with) Harry Duncan of The Cummington Press. Suddenly, the roots and branches of the family tree become more pronounced. Although each of these artists and their presses are, of course, distinct, there is a family resemblance worth noting. Compare Wallace Stevens’ Esthétique du Mal published by Cummington in 1945 to Scott Pierce’s Some Bridges Migrate published by Small Fires in 2008, and you’ll see what I mean. However, in book arts, it’s critical to note the importance of the distinction between resemblance and imitation. For example, there’s a whole lot of Perishable Press knockoffs floating around that aspire to Hamady’s mastery and originality through mere imitation that, unfortunately, culminate in an absurd collection of literary tropes and cute, but meaningless, artsy gimmicks. Resemblance has more to do with a history of ideas, the integrity of the imagination, and respect for the construction of things. Small Fires Press books don’t resemble Cummington Press books any more than Pierce’s poems resemble Stevens’; Bembo isn’t Centaur; and Cherie Weaver’s pictures are quite unlike Wightman Williams’. Nevertheless, there’s an important conversation taking place that speaks through generations, transcends margins and demonstrates a new way of thinking about the art of collaboration in book form. I’ve always assumed that the name Small Fires Press is a reference to Ed Ruscha’s famous democratic multiple, which would be curious insofar as that movement’s (if you want to call it that) approach to publishing is in many ways opposed to the private press / book arts tradition that I associated with Kerksieck. While I consider both small press, democratic multiples were produced in relatively large editions, while Kerksieck’s runs are small, even by small press standards, with usually no more than one hundred copies printed. Where democratic multiples favor clean, machined editions printed offset, Kerksieck’s books are unabashedly handmade editions printed letterpress. And where the democratic multiple is largely aligned with conceptual art in New York and Los Angeles, Kerksieck’s books bring writers and artists together from around the country. They are too eclectic to characterize (and many of the books are collaborations, which adds another layer of complexity), so I’ll just name some names: Kate Lorenz, MC Hyland, Julia Cohen, Mathias Svalina, Laura Swan, Alex Chambers, John Chavez, Megan Gannon, Rachel May, Joshua Ware, Emily Kendal Frey, Zachary Schomburg, and BJ Love. Kerksieck also produces the Matchbook magazine (which is of course, bound in vintage matchbook covers), broadsides, ephemera, and a blank books. As if that weren’t enough, he also prints custom letterpress books of poetry on the side. The books are avaialble direct from Small Fires Press as well as Vamp & Tramp, while the blank books are sold though Etsy. PS. Steve Miller's lively collection of podcast interviews with poets and book artists are downloadable and available for free by clicking here. I can't think of a more entertaining way to use new media to broaden our knowledge of writing and the book.